Movenpick Hotels and Resorts is to open a property within a 40-storey building in Dubai’s Business Bay district next year. The Mövenpick Hotel Apartments Al Burj Business Bay will feature 299 studio, one, two and three-bedroom apartments, a three-tiered podium area with six meeting spaces, triple glazed windows, a spa, gym, swimming pool, all-day dining restaurant and a business centre. 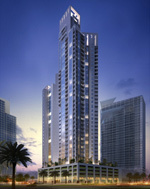 The hotel will be located on Burj Khalifa Boulevard overlooking the world’s tallest building. Movenpick currently operates six properties in Dubai, with the Mövenpick Hotel Apartments Downtown Dubai also due to open in 2017, and the Mövenpick Hotel Dubai Media City slated for 2018. Steigenberger Hotel Group recently opened a 365-room property in Dubai’s Business Bay, the group’s first hotel in the GCC region (see news February 15).